I don’t know why the mainstream media and memes are mocking concerns over Ebola. The disease has spread to several West African countries, primarily in Liberia. (Liberia is named after liberation and its Capitol of Monrovia after President Monroe. It was formed by repatriation of American slaves.) As of now, over 2,000 people are known to be infected, and over 1,300 have died. 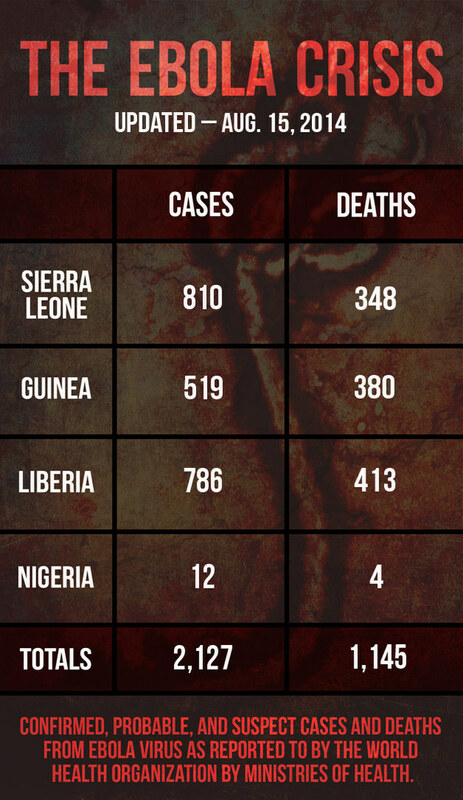 Of that number, 170 dead are hospital workers, including the leading Ebola researcher. There are now clinics and hospitals where Ebola patients lay on their beds but they are abandoned because all the nurses and doctors have died. Can you imagine? It’s like the opening scene of The Walking Dead. You wake up alone in a hospital of dead people with bodies strewn about. Hemorrhagic fever is a rare RNA virus that causes blood vessels and organs to liquefy and you bleed out every orifice including eyes, nose, mouth, etc. Ebola has a 60-90% mortality rate and it is no fun for those who survive and suffer damage from the virus. Unfortunately, those with Ebola can go up to 21 days before showing symptoms. People keep saying, oh, you can only get it by touching body fluids. If it is that hard to contract, how come all the medical specialists on Ebola are dead despite wearing protective gear? Locals are refusing to burn the dead and everything they have contacted. If you bury an Ebola victim, when the ground is wet or it rains, the virus will drift into the water strata, infecting wells and local water sources. The feces, urine, sweat, coughing, clothing, items touched by victims, all have Ebola on them. A non-symptomatic person can for three weeks touch others, contaminate everything they touch, use toilet facilities and spread the virus into the sewage system and water strata, etc. Viruses are not removed in water purification systems as they are too small. Now they are quarantining the most affected areas. Experts expect that everyone within the quarantine areas will die. As a result, military forces are setting up road blocks to shoot anyone trying to escape the area. Two victims are being treated in the Emory University Hospital in Atlanta in the United States. Rumors are that the husband of the nurse has already been quarantined for accidental contact with his wife. In Spain, a Catholic Priest returned home, unaware he had been infected and died after arriving home. The only cure for an outbreak of Ebola is quarantine and burning all exposed materials. The treatment is simply trying to fight the symptoms of the disease. There is an experimental RNA vaccine and treatment that uses human RNA grown in tobacco plants. However, there is still no evidence this will work. In fact, the top Ebola scientist died in Liberia despite taking the treatment. So yes, be worried. There are still people flying to and from this area who might be infected. They are asking them questions, like, “have you been near someone infected?” Knowing that to answer yes means being quarantined and near certain death in an area with no more health care providers alive will certainly induce most to lie to get the hell out of there. Now, there is rioting in infected areas, where what little help they might receive is being destroyed. (See Article below). Please join me in praying for all those affected. Also, join me in telling our leaders to stop allowing people to travel all over the world after being in outbreak areas. Fear and denial of the deadly virus are pervasive in Liberia. The mob exponentially increased the risk in one of the country’s biggest Ebola hot spots. posted on Aug. 16, 2014, at 2:43 p.m.
Tarplah is a registered nurse who’s worked in health care in Liberia since 1989; he opened this holding center for the Ministry of Health on Thursday, and had eight patients. On Friday, before the escape, he had 29. West Point is becoming a hot spot in a hot spot in the biggest Ebola outbreak in history. It’s an informal community, a “slum,” with no running water or toilets. People can live seven or more to a single dwelling, and the density is dangerous: A positive Ebola patient disappearing into the maze of metal shacks can be a public health horror story. Today, things got even worse. They ransacked the protective suits, the goggles, the masks. They destroyed part of Tarplah’s car as he was fleeing the crowd. Jemimah Kargbo, a health care worker at a clinic next door, said they took mattresses and bedding, utensils and plastic chairs. She said the police showed up but the crowd intimidated them. “The police were there but they couldn’t contain them. They started threatening the police, so the police just looked at them,” she said. And then mob left with all of the patients. “They said, ‘The president says you have Ebola, but you don’t have Ebola, you have malaria. Get up and go out!’” Kargbo said. “What’s going to happen when they come to our clinic? In two to five days?” Kargbo asked, referencing the early period when newly infected patients begin to show their first symptoms. “We’re going to turn them around” and send them to a different hospital, she said. Kargbo said the staff at the clinic have no protective gear. They were already afraid about treating possible Ebola patients, and the riot means more infections as escaped sick patients infect their families, and as looters sleep on mattresses where the Ebola-infected have died. Nyenswah could not be reached for comment on today’s riot or its effect on the quarantine plan. Bindu, the 22-year-old who had been quarantined in the center while caring for her dying cousin, told BuzzFeed this morning that the family wouldn’t leave before Kroma got her results. They wanted to follow the rules and stay as safe as possible. But that didn’t mean they wanted to be stuck in there — no cell phone, no electricity, no visitors, surrounded by strangers vomiting and collapsing and dying on the floor in front of them. “We just want to go home,” she said through a window.